The Vitamix blender blades spin fast, crating friction, enough to heat and cook soups. This easy soup can be made in a Vitamix jar and then poured into bowls for serving. It has a fresh tomato flavor rather than one of long cooking time on the stove. For a bolder tomato flavor, you can add a few tablespoons tomato paste or some (8 to 10) sun-dried tomatoes before cooking. To peel tomatoes, immerse them in boiling water for a few seconds to loosen the skin, then peel. The tomatoes can be cut in half to squeeze out the seeds. The seeds can be strained from the juice and discarded; add the juice to the tomatoes. Place stock, peeled tomatoes, garlic, salt, pepper, and five basil leaves in the Vitamix container in the order listed and secure the lid. Remove the lid plug and add the remaining basil to the container. Blend for 15 seconds at low to medium speed. Taste and adjust for salt. 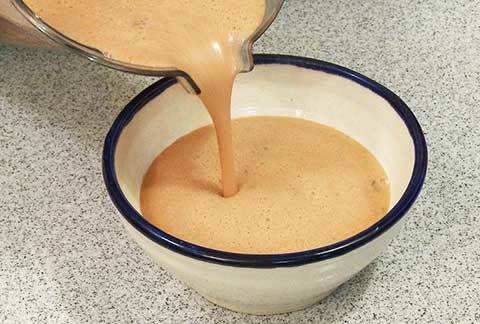 For cream of tomato soup, add about a cup of cream during the final blending step.